Betsafe Poker is a well renowned online poker room and one of the flagship poker skins of the Microgaming Poker Network (MPN). Betsafe is part of the Swedish online gaming giant Betsson Group, alongside two other huge online poker sites Betsson and Nordic Bet. The Betsson Group has been operating successfully in iGaming for 45 years! It is listed on the NASDAQ Stockholm Large Cap List. 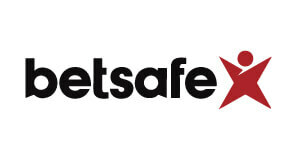 Betsafe first burst on to the scene as early as 2006 and can look back to more than 11 successful years in the poker industry. Since its official launch in January 2006 Betsafe has established itself as one of the most trusted sites in the online poker industry. It started as an independent online poker room and was taken over by iGaming giant Betsson in 2009. 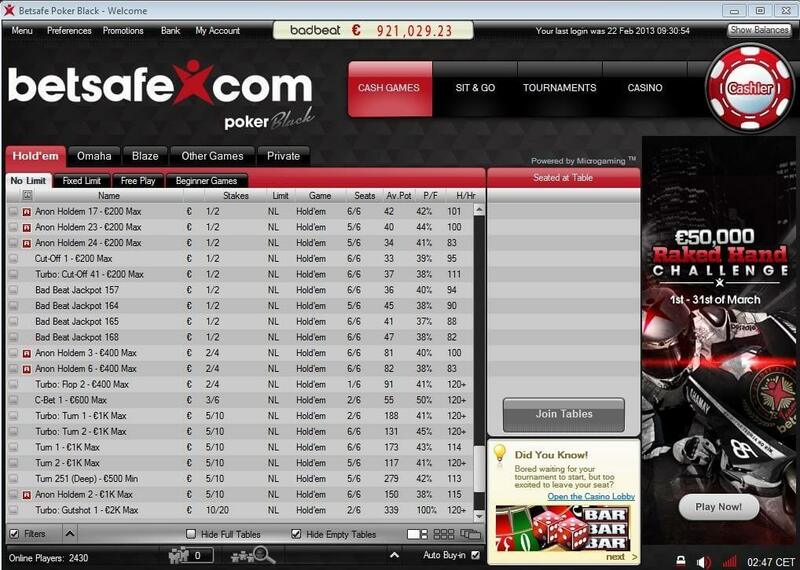 Betsafe Poker itself is part of the largest poker network in the world! Consequently Betsafe is boosting amazing traffic around the clock and offers one of the biggest varieties in games and limits as well as huge weekly guarantees in their poker tournaments and freerolls. MPN is known for its security and reliability and together with great promotions and our fantastic customized deal Betsafe is a great choice for every poker player. In July 2018 Betsafe Poker launched their new Prima Poker Software, which is the biggest poker release in the history of MPN and the result of years of work to stay ahead of the competition. Please read our in-depth Betsafe Poker Review including software, traffic, competition as well as Betsafe rakeback, bonus and promotions. Below you can find an overview of currently available Betsafe Rakeback and promotions. Our Team consisting of professional poker players and online poker experts has been playing a lot at Betsafe Poker and tested all the important criteria to create this review. All of them agreed, that they would definitely recommend Betsafe Poker for both beginners and professionals. 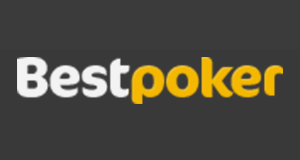 First of all it is the only poker site, where you can choose from five different first deposit bonus options! Then you get a very decent 30% Betsafe Rakeback and can change points for cash bonuses anytime. On top of that come great poker room promotions and huge private promotions provided by VIP-Grinders.com in the best Betsafe Poker Rakeback Deal on the internet. We encourage you to contact our support in case you have any questions or look for a custom Betsafe Poker Rakeback Deal. Please also feel free to leave a comment and let us know how your experience was when playing on Betsafe Poker! 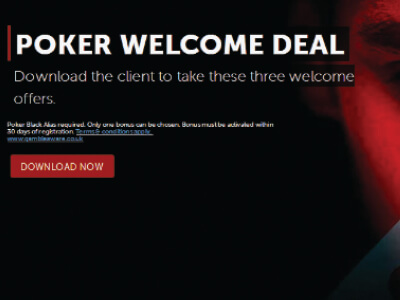 How to open an Account at Betsafe Poker? Opening an account at Betsafe Poker is very easy and only takes a couple of minutes. 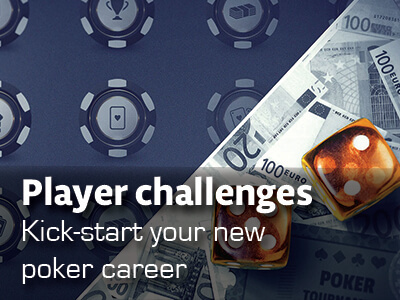 Simply follow our step-by-step registration guide and your poker account together with A MASSIVE FIRST DEPOSIT BONUS OF 100% UP TO €1,000 will be ready to play. As soon as you have registered your Betsafe Poker account, you can make a deposit to claim your €1,000 first deposit bonus. Click on the “Cashier” button in your poker client and choose your preferred deposit option. And that’s it already! Now your account is set up and you are ready to play at Betsafe Poker. Please note, that you do now need to activate your bonus! Go to the tab “available bonuses” in the top right corner of the Betsafe Poker client, and activate your welcome bonus by entering the bonus code of your choice. You have 30 days to activate your bonus. The Betsafe Welcome Bonus is released in 2-4 segments and expires after 60 days! Check the progress of your poker offer directly in the poker room under “My Account” and as you start releasing it, cash will be added directly to your poker account. Betsafe offers some of the best promotions in the poker industry. You will not only receive a fantastic welcome bonus, but also benefit from special bonuses and huge private rake chases. And let’s not forget our great deal, which offers players, who sign up through us 30% VIP on top of the already massive promotions! 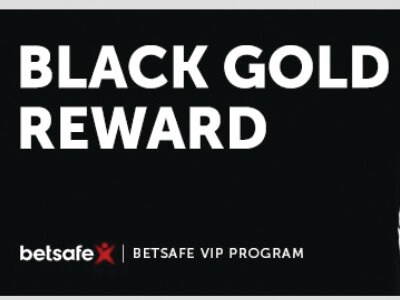 Betsafe offers a generous 100% UP TO €1,000 BONUS which is worth approximately 20% and you have 60 days to clear it. 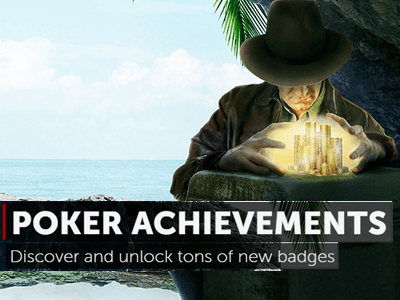 New players also get access to multiple New Player Freerolls, with prize pools totaling at almost €15,000 and the 10 DAY ACHIEVEMENTS promotion, that allows new players to win additional prizes. Please Note: Only new players that are aged 18+ are eligible for this bonus! Wagering as well as terms & conditions apply. Betsafe players receive 30% rakeback fixed, which is calculated according to contributed terms. It is paid out in points and you can change them for cash bonuses anytime. Earn up to €5,000 through our new points chase starting 1st of April and running on a monthly basis moving forward! Fancy to try your luck and play on Betsafe Poker for free? We are running two €250 private freerolls every month, offering great value to our players. The field is usually pretty small, so you can gain some extra and free monies. Note that you can review the Password for all our freerolls in your account with us at ´Promotions` tab once the tracking of your Betsafe Poker account has been confirmed. VIEW OUR POKER FREEROLL SCHEDULE FOR APRIL HERE. Become a Poker Pro when getting sponsored for poker tournaments of your own choice. Betsafe Poker offers further promotions and you can take a look at them at their HOME PAGE. As one of the flagship poker skins of the biggest online poker network in the world Betsafe offers a huge variety of cash games and limits as well as MTTs, SNGs and Spin and Gos at all buy-in levels. The Prima Poker software is one of the latest and most modern poker softwares in the world. 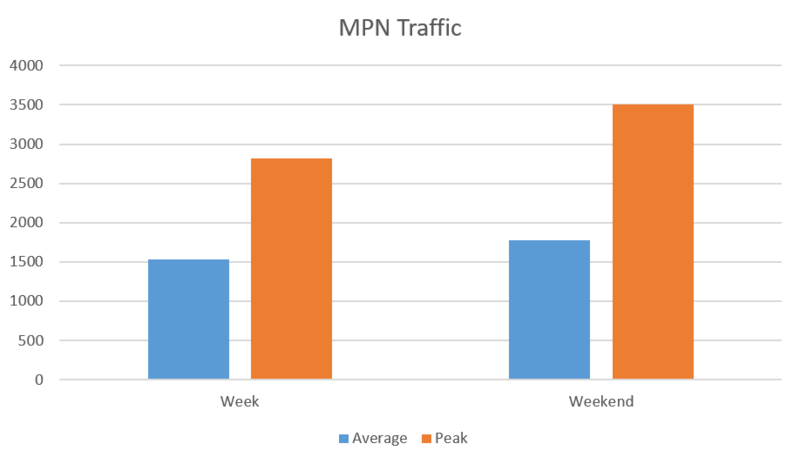 MPN has been working for years on it. What make the Prima Poker software so special are the Ultra High Definition Graphics, its new hand replayer and direct feedbak option, where you can communicate directly with the Betsafe Poker customer service. Betsafe Poker offers a huge variety of games such as Texas Hold’em, Omaha, Omaha Hi/Lo, 5 Card Stud, 7 Card Stud, Razz and 5 Card Draw plus their own fast-fold poker client called Blaze Poker. 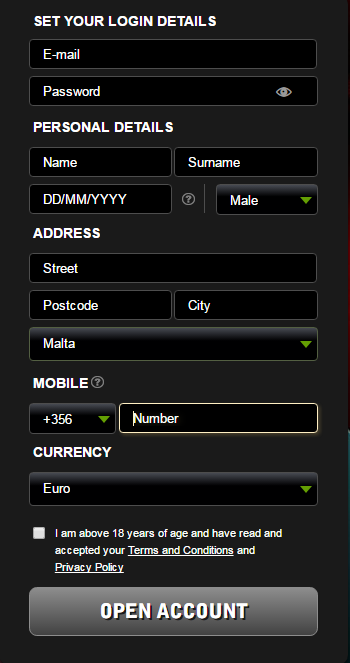 On top of that Betsafe guarantees more than 4 million euro in MTTs every month! Sit and Gos as well as the very popular Spin and Gos, which are called Fish and Party Sit and Gos at Triobet and give you the chance to win a fortune in only a couple of minutes are available! The rake structure at MPN is extremely favorable as well. 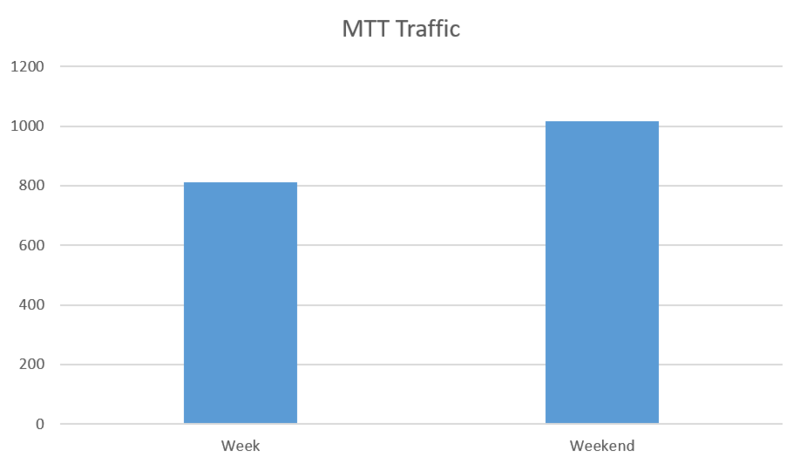 CHECK A DETAILED BETSAFE POKER RREVEIW ON TRAFFIC AND SOFTWARE HERE. One of the best things is that you can play poker at Betsafe anytime, anywhere! 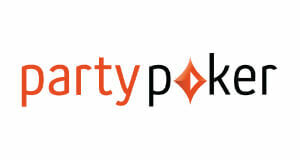 The mobile poker client is available for all smartphones and mobile devices. Playing poker on the go was never easier. Simply DOWNLOAD THE BETSAFE POKER MOBILE APP and enjoy playing online poker on your iPhone, iPad and Android, whenever, wherever. Betsafe offers a great poker room also on your mobile device – you can play cash games or Blaze poker at various stake levels anytime and anywhere! 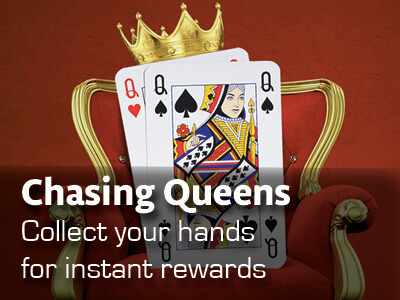 Join Betsafe Poker today and check out their exclusive mobile bonuses and promotions. As mentioned above the Betsafe Poker Mobile App is available for all operating systems and mobile devices such as iOs, Android, Windows, Mac and even Linux. 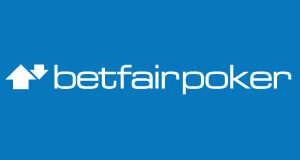 To download the Android version of the App however, please go to the WEBSITE OF BETSAFE POKER. To download the App, simply click the button bellow and install the Betsafe Poker mobile experience, CLICK HERE. 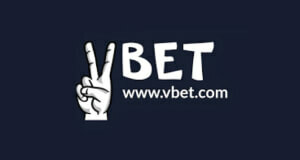 Betsafe Poker offers a great variety of deposit and withdrawal options and cashouts are processed very safe and quick. All common payment options such as Skrill, Neteller, ecoPayz, credit cards, bank transfers are available, so you can choose your preferred one. First of all Betsafe does not charge any fees for withdrawals! Betsafe Poker can look back and praise itself with a history of more than 11 years of safe and fast cashouts. The online poker room is investing constantly in their security department and does a lot to protect the players and their funds. All deposits and withdrawals are processed quickly and the support is available around the clock making Betsafe Poker one of the online poker sites with the highest security when it comes to cashouts. Betsafe poker is eligible in the following countries: Åland Islands, Albania, American Samoa, Andorra, Anguilla, Antarctica, Antigua And Barbuda, Argentina, Armenia, Aruba, Ascension, Azerbaijan, Bahamas, Bangladesh, Barbados, Belarus, Belize, Benin, Bermuda, Bhutan, Bolivia, Bosnia And Herzegovina, Botswana, Bouvet Island, Brazil, British Indian Ocean Territory, Brunei Darussalam, Bulgaria, Burkina Faso, Burundi, Cambodia, Cameroon, Canada, Canary Islands, Cape Verde, Cayman Islands, Central African Republic, Chad, Chile, Christmas Island, Cocos (keeling) Islands, Colombia, Comoros, Congo, Congo, Cook Islands, Costa Rica, CÃƒâ€te D’ivoire, Croatia, Cyprus, Diego Garcia, Djibouti, Dominica, Dominican Republic, Ecuador, Egypt, El Salvador, Equatorial Guinea, European Union, Falkland Islands, Faroe Islands, Fiji, Finland, French Guiana, French Polynesia, French Southern Territories, Gabon, Gambia, Germany, Ghana, Gibraltar, Greece, Greenland, Grenada, Guadeloupe, Guatemala, Guernsey, Guinea, Guinea-bissau, Guyana, Haiti, Heard Island And Mcdonald Islands, Holy See (vatican City State), Honduras, Iceland, India, Ireland, Isle Of Man, Israel, Jamaica, Japan, Jersey, Kazakhstan, Kenya, Kiribati, Korea [KP], Korea [KR], Kosovo, Kyrgyzstan, Lao, Latvia, Lebanon, Lesotho, Liberia, Liechtenstein, Luxembourg, Macao, Macedonia, Madagascar, Malawi, Maldives, Mali, Malta, Martinique, Mayotte, Mexico, Micronesia, Moldova, Monaco, Mongolia, Montenegro, Montserrat, Mozambique, Myanmar, Namibia, Nauru, Nepal, Netherlands Antilles, New Caledonia, New Zealand, Nicaragua, Niger, Nigeria, Niue, Norway, Palau, Palestinian Territory, Occupied, Panama, Papua New Guinea, Paraguay, Peru, Philippines, Pitcairn, Poland, RÃƒâ€°union, Romania, Russian Federation, Saint Helena, Saint Kitts And Nevis, Saint Lucia, Saint Pierre And Miquelon, Saint Vincent And The Grenadines, Samoa, San Marino, Sao Tome And Principe, SaudiÃ¢â‚¬â€œIraqi neutral zone, Senegal, Serbia, Seychelles, Sierra, Leone, Singapore, Slovakia, Slovenia, Solomon Islands, South Africa, South Georgia And The South Sandwich Islands, Soviet Union, Sri Lanka, Suriname, Svalbard And Jan Mayen, Swaziland, Sweden, Switzerland, Taiwan, Tajikistan, Tanzania, Thailand, Timor-leste, Togo, Tokelau, Tonga, Trinidad And Tobago, Tristan da Cunha, Turkmenistan, Turks And Caicos, Islands, Tuvalu, Uganda, Ukraine, United Kingdom, Uruguay, Uzbekistan, Vanuatu, Venezuela, Viet Nam, Virgin Islands, British, Wallis And Futuna, Western Sahara, Zambia, Zimbabwe. Betsafe Poker the flagship brand of the Microgaming Poker Network (MPN). 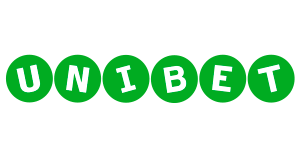 It is also part of the same company as Betsson and Nordicbet, known as the Betsson Group. It’s path towards the top of the online poker sites ranking started in 2006 when Betsafe was officially launched and given full licensing. Since then, they have been developing their service and soon secured their spot among some of the world’s most recognized online poker rooms. As we briefly mentioned above, Betsafe Poker is a part of the Microgaming Poker Network or MPN for short. The network itself has now been in the online gaming market for more than a decade. The highest point of their journey was around the year 2005 when they dominated the European market. Betsafe accepts payments in EUR, SEK, NOK, USD, GBP and CAD but additional options are added regularly. Betsafe offers one of the widest game selection on the market. In addition to Hold’em and Omaha games, you can also play 7 Card Stud, 5 Card Stud as well as 5 Card Draw and even Razz. Stake offered on Betsafe range from NL2 all the way up to NL10000 but there is not much regular action above the NL2000 level. Betsafe Poker also offers special anonymous tables where the player nick names stay hidden. That means that players can use HUD’s at those tables which makes the games there even softer. 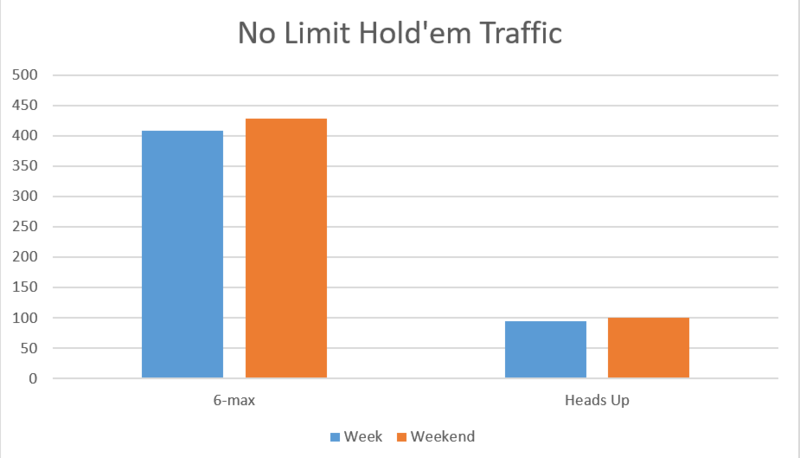 No-Limit Texas Hold’em is the most popular poker game in the world currently so it is no surprise that the NLHE tables get the most of the traffic at Betsafe as well. The largest share of NLHE players at Betsafe plays at 6-max tables, but as you can see in the graph above, there is also some action at the HU tables. Pot-Limit Omaha (PLO) tables also get a decent amount of traffic with games regularly running all the way up to PLO600 but offered stakes range all the way from PLO2 to PLO10000. 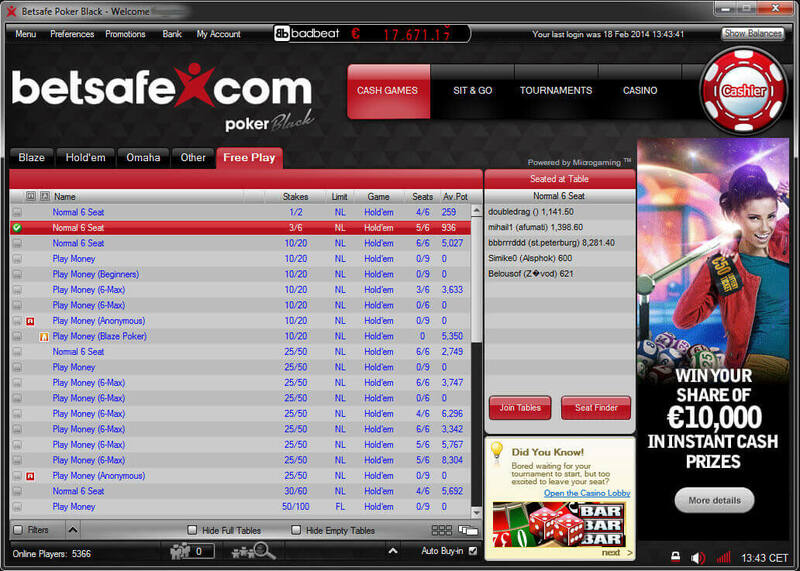 If you play PLO you will enjoy your time playing on Betsafe. Their PLO traffic can compete with most of the world’s biggest poker networks. Even the Heads Up PLO games regularly run all the way up to PLO400. 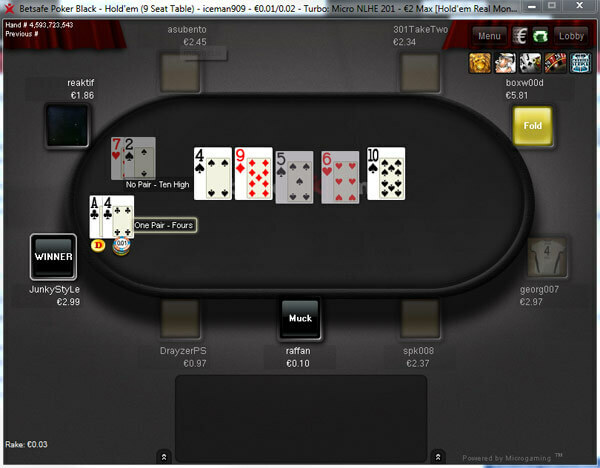 The fast-fold variant of poker on Betsafe is known as Blaze Poker. If you are not familiar with fast-fold poker, in fast-fold poker variants you don’t play with a specific set of other players like you would at a regular table. Instead you compete with a large pool of players at yours take and every time a hand is finished you get dealt a new hand on a new table with new opponents. Betsafe Poker’s tournament schedule offers some great tournaments with attractive guarantees. You can choose from multiple low to medium buy-in tournaments but there might be some less action for those looking for high stakes MTT action. In addition to daily tournaments Betsafe Poker’s weekend MTT schedule offers some exciting majors. Every now and then, MPN runs special tournaments or tournament series that offer huge guaranteed prize pools and loads of soft tournament action. Betsafe offers a good selection of Sit and Gos with various buy-ins ranging from €0,01 to €1050 and formats like Double or Nothing and Fish Party SNG’s. No-Limit Texas Hold’em SNG get the biggest share of traffic but there are Razz and Omaha Sit and Go’s that also run on occasion. Heads-Up Sit & Gos run at all available stake levels and formats from standard to super turbo speeds. 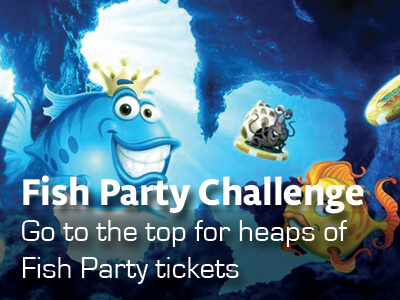 The Spin & Go variant that run on MPN is called Fish Party Sit & Gos. Those 3-handed tournaments run at five different buy-in levels and allow you to win up to 5000x your buy-in or even the jackpot prize that gets higher with every Fish Party SNG played. Betsafe Poker offers a really amazing freeroll schedule with daily freerolls giving away hundreds of euros in cash prizes. New players get to play two New Player Freerolls offering a €1000 and a €888 prize pool. You can find both in the “Freerolls” section under the “Tournaments” tab. We run two private freerolls every month with great value for our members. The prize pool of every weekly freeroll is $250 and the field is usually pretty small, so you can easily boost your bankroll for free. Note that you can review the Password for all our freerolls in your account with us at ´Promotions` tab once the tracking of your Partypoker account has been confirmed. In July 2018 Betsafe Poker launched its new Prima Poker Software. The new poker client is highly customizable and includes revolutionary features such as a new loyalty program, Ultra High Definition graphics, a player history tool with a feature that turns a hand history into a GIF, so that poker players are able to share their hands on Social Media and much more. The client looks great and can be visually customized to your preferences. A wide variety of customization options are available in the Betsafe Poker client. Customizable Hotkeys, alerts and shortcuts make grinding easy. The Betsafe Poker lobby is easy to navigate and it allows you to find and join your favorite games in no time. To locate your Betsafe Hand Histories go to its install folder that is by default saved in C:MicrogamingPokerBetsafe. Our Betsafe Poker Rakeback Deal offers players great value in addition to significant extra rakeback through our private and exclusive promotions for Betsafe Poker. Our members have access to our exclusive leaderboards, chases and even private freerolls. Betsafe Poker is on the forefront of innovation when it comes to their Prima Poker software, new poker variants, security improvements and customer experience. Their ongoing promotions cater to professional grinders as well as recreational players. 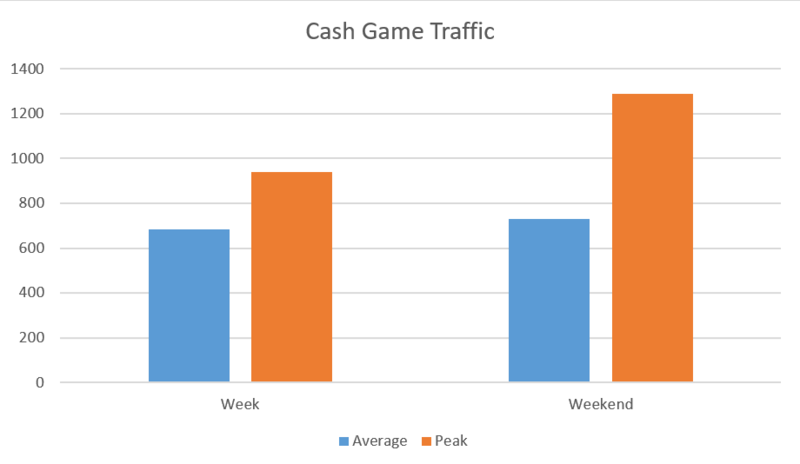 Cash game players will enjoy their huge selection of games and good traffic at most stakes. MTT players will be amazed with the softness of fields but might miss high stakes action as regular tournament buy-ins usually don’t surpass €60. Nonetheless, Betsafe Poker remains a fantastic place to grind and we would highly recommend it to all kinds of online poker players. Sign-up with Betsafe Poker below.